The recent launch of Playfish’s EA SPORTS FIFA Superstars was a great success and the game is proving to be a big hit worldwide. We are especially pleased to be able to bring the beautiful game of football to Facebook and to Playfish fans everywhere – especially just as the 2010 FIFA World Cup™ in South Africa has gotten under way. To celebrate the release of the game, Playfish hosted a FIFA Superstars “friendly” – a spirited football match featuring several members of the London media at a pitch in Battersea Park. The teams hit the pitch wearing exclusive FIFA Superstars blue and white kit made especially for the match. At kick off, Team White came out with guns blazing and shots hitting the mark, building a quick lead over Team Blue. Though down, but definitely not out, Team Blue found itself on the short end of a 7-2 score at the end of the 20-minute mark. In a lively second half, an undaunted Team Blue stepped up the pace, outscoring Team White 5-3. Alas, it was too little too late and Team White ultimately prevailed 10-8. Nicely done, lads! And a special congratulations to Michael Sawh of Team White, who was awarded Man of the Match. With the match over, but players still hungry for more football, everyone headed to a nearby pub for FIFA Superstars demos from members of the game’s production team. Playfishers Henrique Olifiers, John Earner, Raf Keustermans, Andy Watson and Tom Sarris were on hand to provide our special guests with valuable tips for claiming ultimate victory in FIFA Superstars. In all, it was a great afternoon and a fun way to kick off FIFA Superstars! LONG LIVE FOOTBALL! LONG LIVE FIFA SUPERSTARS! Have you ever dreamt of managing a football team comprised of the world’s greatest players? Now, just in time for the 2010 FIFA World CupTM, we’re pleased to announce EA SPORTS FIFA Superstars! Here’s your chance to take control of the ‘beautiful game’ to see if you can do a better job than the pros. FIFA Superstars lets you build a team of real players and compete with the whole world on the football pitch. First, you’re assigned a set of football players to develop your team around. Players are rated on their shooting, control, stamina and strength, with the ratings based on real world statistics. So if you’re lucky enough to have, say, Cristiano Ronaldo on your team, he’s going to have much higher stats than a less accomplished player. So you’ve got your team lined up, but what if they’re just not all that hot? Well, that’s where the game starts getting really fun! Buying Bronze, Silver or Gold transfer sets gives you a random group of players of roughly similar skill range. Bronze players are international quality, Silver players are star footballers and Gold players are the football world’s superstars – the best of the best. Once you’re happy with your team you can take them to the pitch to play some games with other players. You can play each of your friends once a day, earning cash and building experience. You also can play league games, climbing ever higher to face better and better players around the world. The more cash you earn, the more you can spend on transfers and taking your team to the big time. You’ll also need to ensure your team has a consistently high standard of training and fitness, which improves its abilities on the pitch. Additionally, stadium upgrades increase your team’s revenue and training levels. FIFA Superstars features four modes of exciting play: Friendly matches, League matches, Premier League (and more of the world’s top leagues to come soon), and 2010 FIFA World CupTM. You can win some amazing prizes in 2010 FIFA World CupTM mode. Just predict the scores for upcoming games, and if you guess the winner or the score correctly you’ll earn points which add up to Coin prizes, Match Credits and even Gold rated players! Even better, the more friends who play the 2010 FIFA World CupTM Mode, the better your chances at winning prizes – so remember to get everyone involved. Not only will you earn more together but you can finally prove once and for all who really knows football best! Just like the start of your favorite team’s professional league, this is only the beginning for EA SPORTS FIFA Superstars. There’ll be all kinds of amazing new features to try in future and much, much more. So step onto the pitch, make wise training and transfer choices, and you’ll have the chance to take your team all the way to the top of the world! Do you have what it takes? Interview with Andrew Ow, Product Manager of My Empire! Hear ye, hear ye! Playfish has released a new game and we, the People, demand word from the Product Manager of My Empire! Join us now and be part of an audience with Andrew Ow! Good sir, would you kindly begin by explaining to us your role in bringing My Empire to us? Hello and of course. My name is Andrew Ow. I am the product manager of My Empire and responsible for deciding what the game will look like and play like. It is a really exciting job and working with the whole My Empire team has been great. Building an empire is fun! 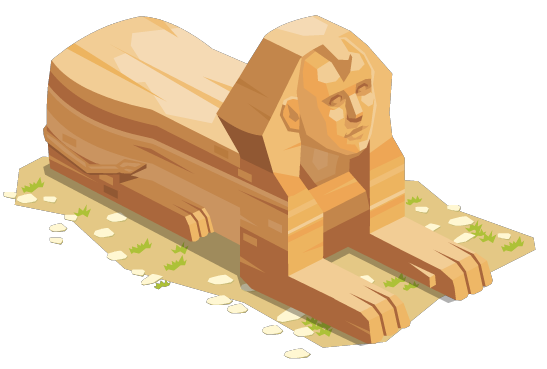 We wanted to create a beautiful and easy game to get into which lets you have play with ancient themes. You can interact with friends, expand your land and create really stunning empires due to our lovingly detailed graphics. The My Empire team is extremely excited to see what the players make of it since we think we have created something really different and fun. Indeed, My Empire is a delight for the eye! Can you describe to your humble audience the aim of the game? 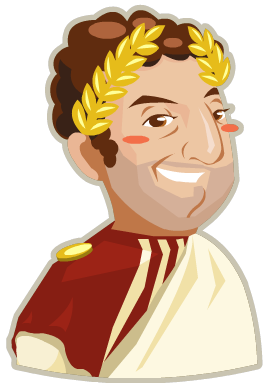 The goal of My Empire is to create a glorious ancient empire – but what that means is completely up to you! Players can aim to create the most beautiful empire, build a Wonder (or all of them! ), or have the largest population. It’s very open ended. I think new players will love the feeling of constructing Wonders. We have some really great Wonders like Stonehenge, the Pyramids, and the Parthenon. Our artists have really done a fantastic job creating them – they look stunning, and do great things for your empire as well! So many things to choose from! It baffles the mind! But, my lord, perhaps you can help narrow this down with a suggestion as to where to begin? My tip would be to be sure to building both houses and happiness buildings. Houses allow more citizens to live on your island, but you need to keep your citizens happy as well. Keeping a good balance is a key part of having a growing empire! Wise words… surely such wisdom is learnt from having faced challenges during your reign? I’d say the most challenging aspect of working on My Empire has been deciding which of the many exciting features to add. We had so many ideas that we really had to pick and choose what to do each day. The good news is we have many ideas for new features in the future and we hope you’ll be enjoying them with us! Then it seems, my lord, you have had a most joyful experience building My Empire? Yes! The most fun aspect has been seeing the game get better and better each week in all ways. For example, we started without any art for the Wonders, so it was hard to imagine how cool or impressive they would look. The week we added the Wonder art everyone at the office was so impressed, our whole studio was racing to be the first to complete Stonehenge! Ah, a tale to be told for years to come! And as the months come and go, what do you foresee for the citizen of My Empire? I don’t want to give away anything too exciting – but it will definitely give old and new players something fun to do. All I can suggest is keep a close eye on the My Empire Facebook page for the latest news. Ah my lord, you are a tease! But sir, so that I may know it when I pass by, what have you called your empire and why? My empire is named Haogang, after one of My Empire‘s excellent programmers. He accomplished some truly legendary work during the course of our project, so I had to commemorate him! *Wipes a tear from eyes* That is so sweet… ahem… I mean… Bravo! And what kind of leader would you describe yourself as, my lord? I am a leader obsessed with empire beautification! I try to lay out parks and open areas for my citizens to enjoy. My roads are lined with trees, and one time I even constructed a hedge maze. As you can imagine, I am excited when I unlock new decoration items each level! My lord, I feel our time is coming to an end. Before we leave, what wise words would you like to leave with us? First of all, thanks so much for playing! I would also like to let our players to know that they can leave feedback on our game’s Facebook page or forum. We are listening to you and will do everything we can to make this game great! Friends, Romans and citizens. 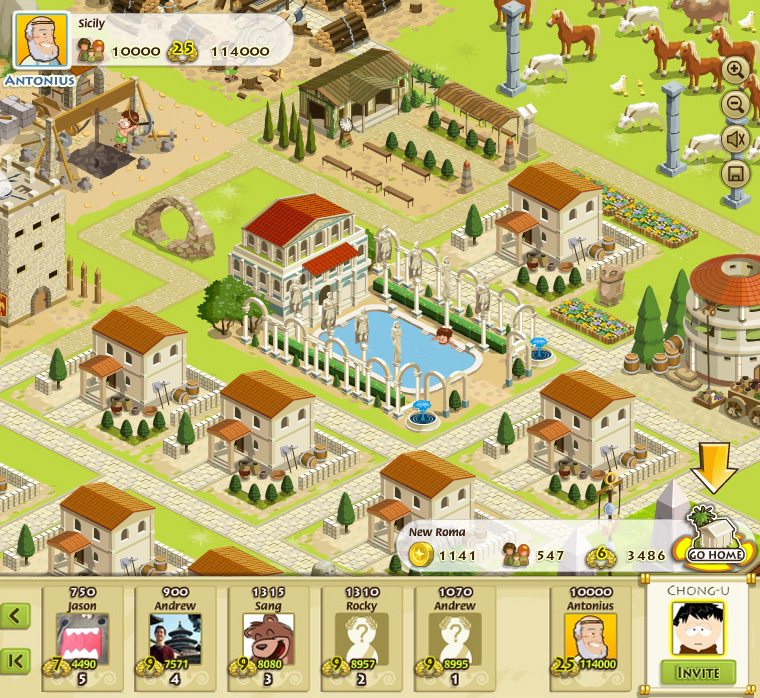 The time has come to make your marks on history with Playfish’s latest release: My Empire. Each one of you has been given an island to make your own and enough gold to build the foundations of a mighty empire. 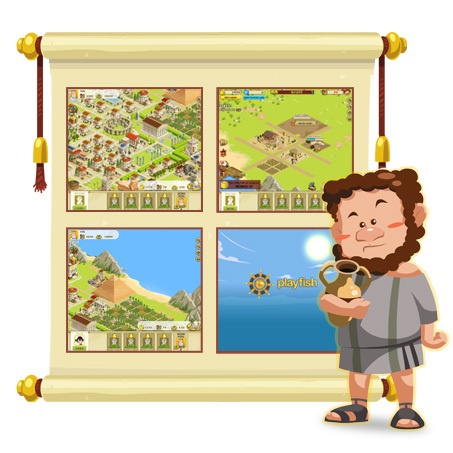 You have each been given the finest ships in the Roman empire’s fleet, that you may set sail for each other’s islands, earning Coins for your colony through good will gifts and trading. Each of you is placed in control of your own empire’s destinies, and the destinies of the very people who populate them. Treat them well by building fine baths, arenas and other luxuries and your population will grow and prosper. And with a growing population comes more taxes to collect. Your people may be loyal to you, but they still have needs for creature comforts. A happy population is a productive one and the population’s mood can be improved by planting trees and flowers, erecting statues and laying roads and hedgerows. Make your city beautiful and your citizens will be proud to call it their home and thank you with their devotion. As your population of devoted subjects grow, so too will the number of ways you can put them to work for you and help you raise your empire to glory. You and you alone are in control of your empire and the way it grows under your guidance will say much about the way you think. You could have them build a mine to dig for iron, copper, silver and perhaps even gold, or construct a quarry to search for precious stone. By collecting more of these valuable raw materials you can set your loyal citizens to work creating a masterpiece — a Wonder of the World. Achieving the truly legendary status of building a Wonder of the World is one of the highest honors you can achieve and the choice of different Wonders will astonish and amaze, ranging from the mighty Colossus of Rhodes to the mysterious Sphinx and many more between. Who will be the first among you and your friends to construct them all? But Rome wasn’t built in a day. You’ll need your friends to help you construct your finest achievements, whether by sending you gifts or by enlisting them to help you to build. Lend help to your friends when they need you and they’ll be there for you when you need them. The more friends you have who create colonies in neighboring islands the more rich opportunities will be uncovered, all yours for the taking. So set sail for distant lands to explore because this is only the beginning, and who knows what marvels await in My Empire? Play it now to find out! A letter to our fans. When I heard that our company blog was looking for people to write for it, I couldn’t wait to jump in there and tell you all about how exciting it is that we’re hiring. My name is Ken Ward and I lead the recruiting team at Playfish. Officially they call what I do ‘Talent Acquisition’ – and that’s not too far from the truth. We have a great team spread over four studios – London, San Francisco, Norway and Beijing – on three continents, dedicated to hiring the best and brightest talent to join our fishbowl. If you’re wondering how many people we’re hiring, let me put it this way: sometimes I come in on a Monday and think I have walked into the wrong office because there are so many new faces! I know we have found the right people to work for Playfish though when I look around and see everyone huddling together and talking about new ideas and the things they love. What’s even more amazing is that we truly are representative of the United Nations, with staff at all of our offices coming from every corner of the world, all of them working together enthusiastically. 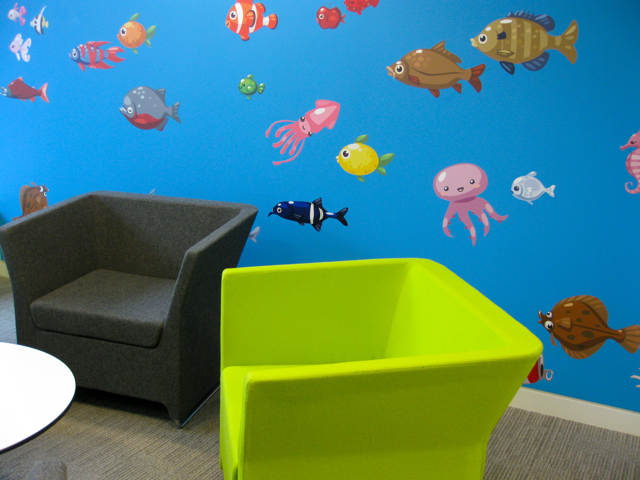 I’ve recruited in many different environments in my career, including banking (it’s on the CV and that’s where it’s staying), and Playfish is a joy to recruit for and by far the most enjoyable. It’s a truly creative and fun environment and, as we expand, it’s super important to maintain that essence as we grow… and it’s a real challenge I enjoy squaring up to. 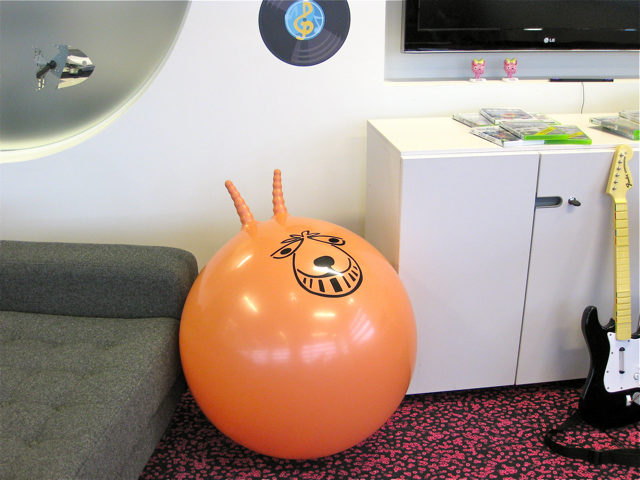 We focus on giving Playfishers all the tools they need to do their jobs – from providing great equipment and talented colleagues to work with, to an excellent office environment that is inviting to walk into every morning – though I’m still not quite sure where the huge orange space hopper appeared from…! I’ve been so impressed with how we connect the offices in such a global environment. The vision is consistent from office to office and it was so cool last year to meet colleagues from all around the world at our annual meeting, Fishbowl 2009, sharing ideas and helping to drive the company forward. Our leadership team (that’s Kristian Segerstrale, Sebastian de Halleux and company to you and me) are instrumental in driving and supporting this connectivity, and our people, regardless of location, really feel at the heart of things. We share videos from each office at our monthly meetings which is a great way of keeping in touch but we also use a whole myriad of communication tools like instant messaging, VOIP calls as well as other more traditional forms such as email and just huddling together over a coffee in our office breakout areas to talk about exciting new possibilities. I feel very lucky to be here and to be one of the people helping Playfish to grow, not only in size, but in its ability to do what it does – for you, our players – better. And if after reading this you think you can help us to make great social games, too, I’m inviting you to jump right into the tank and let us know! 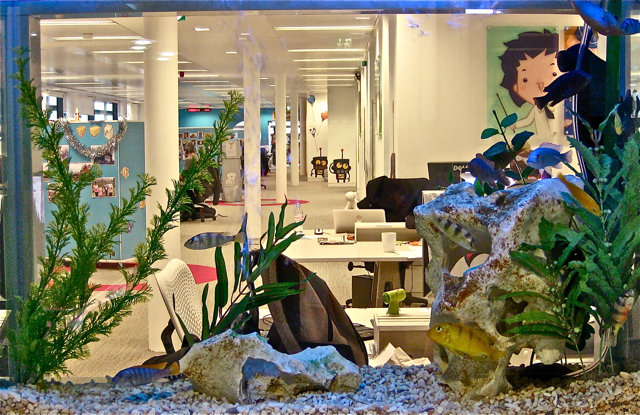 If you daydream about working at Playfish, check out our careers page or email careers@playfish.com. A chat with Pet Society’s Product Manager, Vivienne Bearman! Hi guys! As Valentine’s Day draws nearer we’ve seen lots of romantic items appearing across all of our games – from the sweet Valentine’s Day theme gifts you can send your fellow culinary friends in Restaurant City to the beautiful romantic Victorian set available in Country Story, I got in touch with Vivienne Bearman at Playfish HQ to find out what she and her team have got in store for Pet Society fans. Hi Vivienne. Thanks for taking some time out of your busy day to chat with me and our readers! 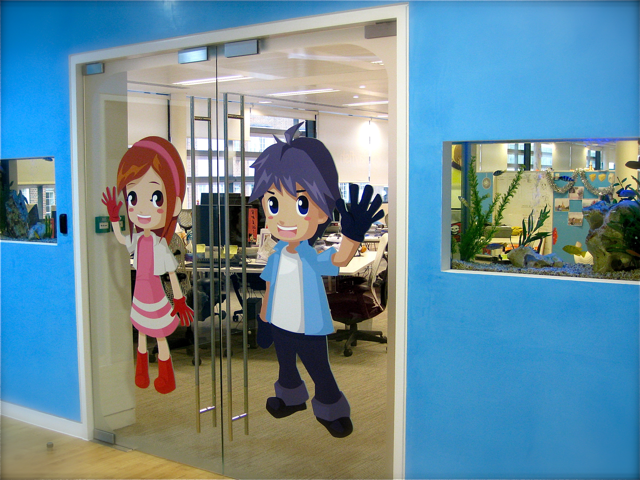 Would you let our fans know what you do here at Playfish? Sure! 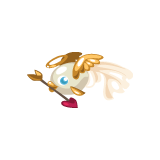 Hi guys – I’m the product manager for Pet Society which means I keep an eye on what players are doing in the game, as well as listen to their suggestions and feedback and use it to make the game better for our players. Cool! But for those who haven’t played Pet Society yet, would you give people a quick description of what the game is about? Pet Society is a game you can play on social networks like Facebook and MySpace. It’s a casual game where you create an animated pet of your choice to take care of. But there is just so much more to it than that – and that is what makes it special. Pet Society is designed so that you can play with your friends and family. For instance, you can visit your friends’ pets at their houses or send them really cute gifts. There are tons of items to collect, whether you want them for yourself or to give to your friends. You can also go fishing with your pet and collect all sorts of weird and wonderful fish, or become a pro-athlete at the Stadium and win lots of coins and achievements. There’s just so much to do I could spend all day telling you about it. Though it’s a very casual game, I have to admit I’m a little addicted and spend as much time as I can on there! That sounds fun! You mentioned there are lots of things to collect. 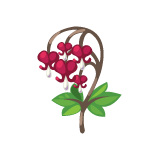 What new things do our players have to look forward to as we get closer to Valentine’s Day? On the Valentine’s theme, I noticed that the Pet Society Fan Page recently announced a competition, too – can you tell me a little bit about it now? Well, we’ve asked our fans to show us what their pet’s perfect Valentine would look like by submitting pictures to the competition page. The game is really great for giving our players the creative space to express themselves and we’ve been getting loads of really fantastic entries. I can’t wait for the winners to be announced. We’ll be taking entries until Sunday 14th February at midnight GMT and winners will be announced on Friday 19th February. The best entry will be rewarded with 500 Playfish Cash and a personalised gift for your Pet Society pet, as well. All of our fans and players can keep track of all of the latest Pet Society news and announcements at the official Pet Society blog and the Playfish blog. Excellent. This month has been very busy for Pet Society! You’ve also released a brand new game feature, is that right? Yeah! I’m really excited about this particular new release. The recent new feature lets your Pet Society pet have their own pet – we’ve called them Petlings! Players can go to the Garden store and buy either a kitten or a puppy for their pet. We’re planning on releasing more Petlings in the future so we hope the fans will definitely be watching this space for more news on that. On an unrelated note, I just wanted to mention that we’ve also increased the number of ways players can earn bonus coins – from playing the daily lottery to walking around town to collect coins that drop from trees. So, yeah, we’re constantly improving the game. So many new features! How do you come up with these ideas and keep the game feeling fresh? I count myself very lucky to be working with such an amazing team. Our artists have a fantastic feel for who our players are and what they want. We also have very dedicated coders and developers for the game. We all work passionately to bring something new and exciting to our fans every week. The Pet Society themes are sometimes tied to fun festivals around the world and we also pay attention to what people are saying on the Pet Society forum. In fact, we asked our players what they wanted to see in the game toward the end of last year and we’re now using that feedback to help us plan out the next few big item themes. The Pet Society team are really friendly and we all get along really well together. I think this really shows through in the game, both in the cute graphics and the happy themes we come out with. What would you say you’re the most pleased with so far? I just love that we’ve created a game that lets friends and family play together. And it’s such a quick game to get into – it’s not challenging but there are lots of things to do if you put the time in – if you want to, of course! I really love that I can visit a pet’s home and just check out how creatively the owner has used the items we created for them. We’ve seen some really sophisticated designs and themes appearing and it’s so wonderful to see our players finding a form of expression through Pet Society. Well it has to be asked, Vivienne, what’s the name of your pet? Hahaha. I’ve called her Tinky. That was the name of my first cat when I was little. And dare I ask which of the Playfish games is your favourite? 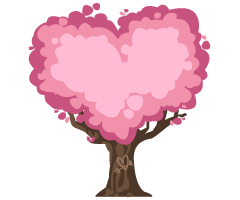 All of our games are beautiful – everyone at Playfish really puts their hearts and minds into them and I know we’ll continue to make them better for our players. So even though I naturally spend a lot of time on Pet Society, I really do love all of our games! And finally, Vivienne, any last comments? Definitely! A shout out to our fans! 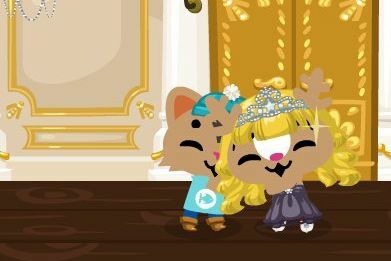 We’re always interested to hear what players want from the game and the best way to tell us is through the Pet Society forum. We are often running surveys there which players can get involved in if they want, and someone from Playfish is online there 24/7 to listen to players ideas and concerns! Thanks, Vivienne – and I’m sure we’re all looking forward to more fun releases on Pet Society! 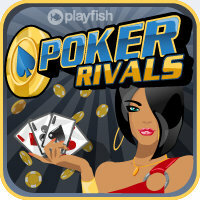 Playfish goes all in with Poker Rivals! We’re excited to announce that we’ve just launched our brand new poker game Poker Rivals! 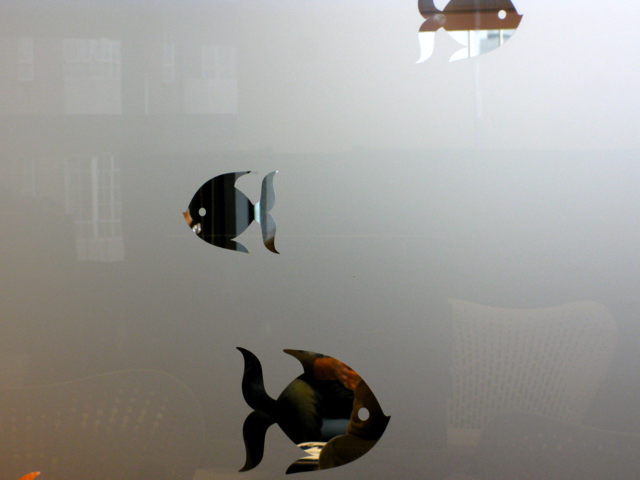 Poker is an enormously popular game worldwide, so we thought it was high time we gave it the Playfish treatment. We’ve put a lot of time and thought into getting the poker experience just right and we hope it shows. 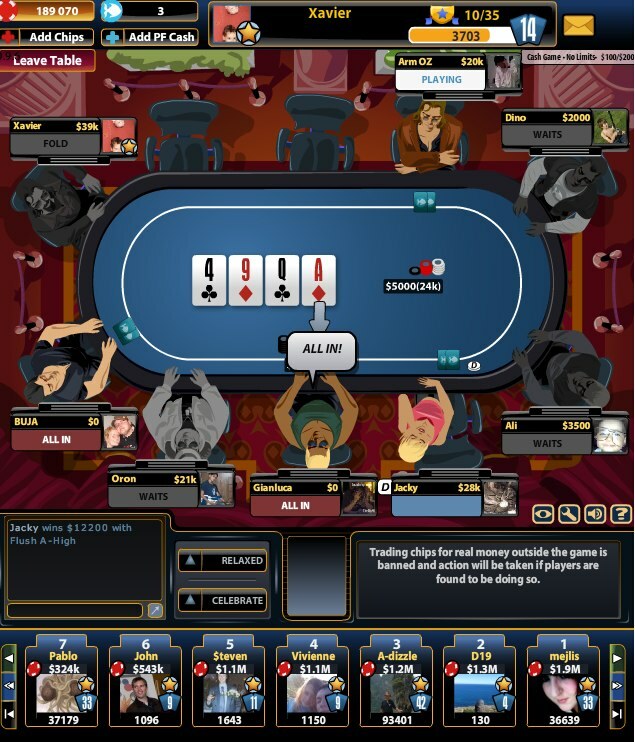 Texas Hold ’em is by far the most popular poker variant so we’ve started out with a fully featured version of Texas Hold ’em just how you like it, but we’ve added a few extras to help you get the most out of your experience. Poker Rivals is authentic poker. Show how you feel with gestures, communicate with speech options and just socialise and have fun meeting new people and old friends alike. 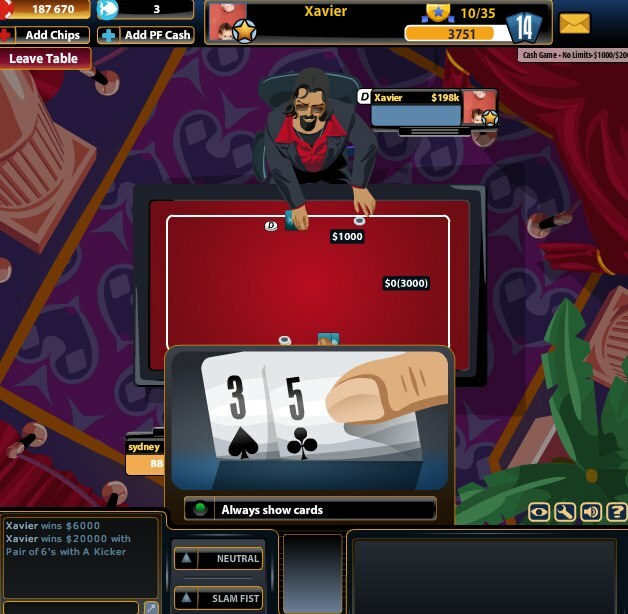 Show your style through your character and show your skills on the poker table. Poker Rivals is the cutting edge in poker and there’s no better way to show your friends what you’re made of. We’re particularly proud of the character customization features. We know self expression is important to you, so the way your character dresses, looks, and lives in Poker Rivals can be modified and customized until it’s just right. Wear shades for that perfect poker face, buy a new pad to play in or even a yacht — although you’ll have to be a real hotshot on the tables to earn that kind of money. Everything’s tweaked and perfected to give you an authentic social poker experience, but the best way to see what Poker Rivals has to offer is by playing. So why not go all in right now and give it a shot? Click here to join the poker revolution. And if you like what you see be sure to stay tuned, because we’ll be adding more features in the coming weeks. This is just a taster of what’s to come! 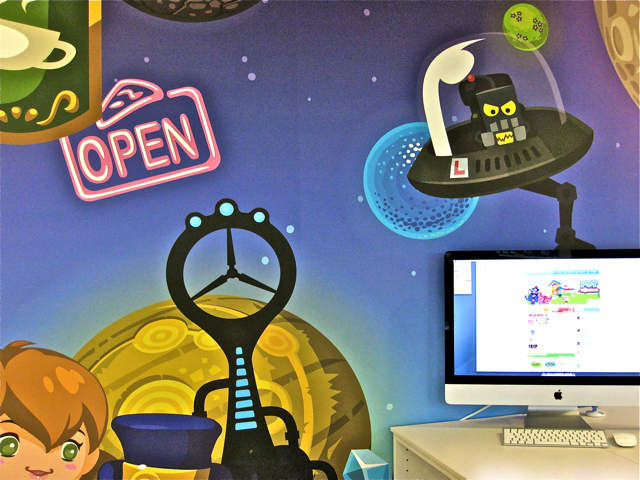 It’s ‘All Go’ for Lift Off to Crazy Planets! Today Playfish celebrates the launch of its latest game Crazy Planets, where we blast you and your friends into space for intergalactic battles on an epic scale! In Crazy Planets all the action starts from the headquarters on your home planet where you recruit your own team of space troopers, specially selected amongst your friends, to take on the invading aliens and robots at full force. To make things even cooler, you can personalise your character by integrating your profile photo into your space suit. Your enemies will definitely know that it’s personal! Through battles and adventures you’ll discover remote planets where you can gather precious gems and metals to create new, more powerful weapons! Each weapon has its own behaviour and special powers, so building your team of troopers will require strategy and planning. As team commander, you return to your home planet with new found riches to grow your world so it becomes the most powerful and renowned in the universe! The true test for any space commander is, of course, how they can hold up in a battle against their peers. We’ll soon be introducing a real-time Multiplayer Arena where you’ll be able to put the tactics you’ve learned against aliens and robots to use against the ultimate competitor – your real-life friends! With Crazy Planets, we set out to combine more active real time gameplay with elements of longer term growth and tactical depth. At the same time, we’ve aimed at creating a fun experience that feels fresh and creative, with the familiar playfish graphical style and approach to gameplay. Throughout the closed beta we have received a lot of great feedback on how to improve the game (thank you, beta testers!). We have a nice roadmap of new features planned in the coming months, and as always, we look forward to hearing your ideas and comments about how we can take the game even further, so keep them coming! So, assemble your troops and get ready for some explosive, out of this world fun! Who will reign supreme in your galaxy of friends? Start your adventure now! Who Has The Biggest Brain? now available to play with your friends on Android! Today we are proud to announce the release of our first social game for Android: Who Has The Biggest Brain? Like 15 million web users and countless iPhone users, Android fans will now be able to play together with their Facebook friends anytime, anywhere. There are well over 3.5 billion mobile phones in use today. That is one phone for every two humans on planet Earth, in other words, mobile phones have become the most ubiquitous platform in the history of mankind. Even the world’s 1.5 billion web users seem a small audience in comparison. Stats like this get us excited at Playfish where our mission is to change how the world plays games, no matter where they are played. We’re committed to new and innovative platforms and are excited about our Android launch. We believe there is a revolution underway, transforming how games are played on mobile phones, through social network connectivity and friend-centric experiences. Who Has The Biggest Brain? is available to download from the Android marketplace today, with Geo Challenge and Word Challenge to follow soon. We hope you enjoy it and would love to hear your feedback! Cook up a storm with Restaurant City! We’re really proud to announce that Pet Society is now the most used app and game on Facebook with nearly 3 million daily active users and we’ve been working hard around the clock to keep bringing new features and additions, but we’d also like to show you something else we’ve been working on. Cooking’s great. First you get to choose which ingredients to use. No more eating around the pickles. Next you get to use fun things like blenders. And then you actually get to eat it! But then there’s washing up. And drying. And putting away in closets. Kind of takes the fun out of it, doesn’t it? So why not make your friends do it for you with Restaurant City! First we’re going to give you your very own restaurant. You can name it, decorate it, fit it with all the equipment you need, and customize every little detail right down to the chimney pot. Or chimney pots. Or just make it one big chimney pot. The only limit is your imagination. Next up, we’re going to add a pinch of friendly rivalry. How about say a street full of your friends’ restaurants, all vying for the same customers? In fact, why not take a walk and check out the competition? You might be able to pick up a neat trick or two. Add a liberal sprinkling of different dishes which you can put on your very own menu — each requiring a different set of ingredients which you’ll need to find and trade with your friends — and you’ve got a recipe for some delicious fun! So now you’ve got the smartest, best equipped restaurant on the block, you’re going to need to find someone to cook for you. That’s where your friends can help you out. You can choose who works for you and what they have to do. And if you’re feeling generous you can even let them take a break once in a while. You can even buy new clothes for your character, to make them as smart or ridiculous as you like. It’s worth it just to see the look on your friend’s face when your character turns up for work at their restaurant wearing a cheese shaped hat! We hope you like the art style we’re using in Restaurant City. We chose to go with a cartoon style because it’s easier to get great results in Flash, and choosing to work in three dimensions make the possibilities for you to customize your avatar endless. So what are you waiting for? Click here to play Restaurant City now! We think you’re going to love it! And last but not least, a big thank you to everyone who’s been testing the beta version of the game. We’re still not ready to move the game out of beta yet but we’re enormously grateful for all of your suggestions to help make the game absolutely perfect, so please keep them coming so we can make the game work exactly as you’d like!